FreedomPop seems to have borrowed a page out of Mint SIM's playbook. The company is now offering multi-month plans that come with big discounts for those willing to commit to service for longer than one month at a time. The plan length and data amounts included are identical to what Mint SIM offers but the FreedomPop plans come with cheaper pricing. FreedomPop's featured plan includes unlimited talk and text with 10GB of data at an average cost of just $19.99/month when paid for one year in advance. Perhaps best of all is that the plan utilizes FreedomPop's GSM network partner, which is believed to be AT&T. Data is hard capped on all plans and there are no overages. Additional data can be purchased at a cost of 2¢/MB which works out to about $20/GB. In general, FreedomPop phone plans are designed to try and upsell you on services. They are often missing basic features that one would expect to get with a phone plan. In this case, the plans lack MMS messaging and voicemail. FreedomPop typically charges about $7.99/month to get those features as part of a package add-on. The add-on also includes data carryover, data compression technology which helps your data last longer, and talk, text and internet encryption for privacy. Some folks who want voicemail and MMS like to forego the $7.99/month add-on and use Google Voice free of charge for their voicemail and MMS messaging needs. Additionally, FreedomPop provides talk by way of VoIP as opposed to over AT&T's cellular network. VoIP services can sometimes add a little bit of latency to phone calls. This means that sometimes when someone is speaking there may be a slight delay before the person on the other end of the line hears what was just said. On occasion this leads to the two parties to talk over one another. One final issue to be aware of, is that FreedomPop is not known for offering the best customer support experience. If your OK with some of the pitfalls just mentioned, FreedomPop's prepaid plans are really a great deal. They are the cheapest on the market to offer unlimited talk and text with copious amounts of data. No other ATT based provider offers more data for less. 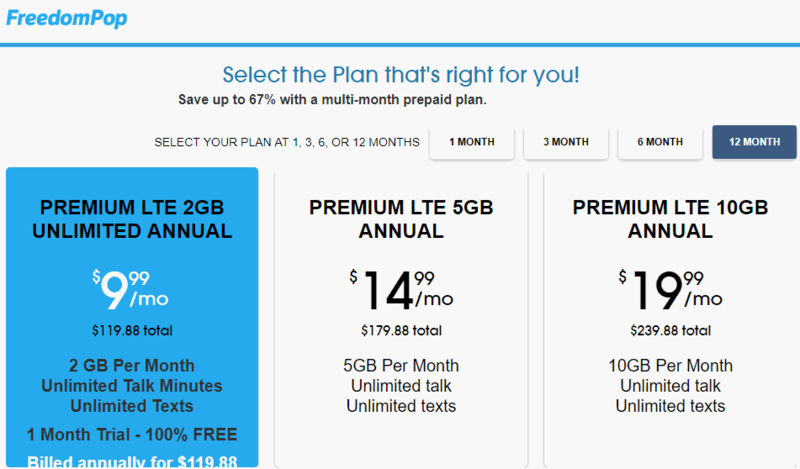 Compared to T-Mobile MVNO Mint SIM, all of FreedomPop's multi-month plans are cheaper. For instance, Mint SIM's plan with 10GB of data costs $25/month when purchased a year in advance. Keep in mind that Mint SIM plans do include MMS messaging, voicemail and unlimited throttled data once the high speed data allotment gets used up. However, in terms of network coverage, FreedomPop is tops. Do these FreedomPop plans include hotspot/tethering capability? Cannot find the plans shown in the screenshot here ANYwhere on the freedompop website. Can you please provide detailed instructions on how to find these plans on the freedompop website? Plans are still there. Choose 3 in 1 sim card kit. Then the talk text and data plan. Then view prepaid plans. I saw their ad for the 5gb/month multi-month plan and now that it’s been a few days trying not I call them up and they say they don’t know anything of the offer and I can’t find it on their site any more.. what’s the deal? Is this a conspiracy or did I seriously just miss this offer when I got it?! The offer is still there, and the links in this article still work to take you to them. It takes a few clicks and selection choices on the FreedomPop website to see them. Hey thanks you are right. They are kind of shady with their plans by hiding them cuz I had to log out to see them and like I said I called them and they said they didn’t know of it. Tried to check plans at their website and Freedompop won’t even show their plans unless I give them my email. Not a very friendly presentation to the public. Oh well…. NEXT! You don’t have to use a real email address, or house address to see the plans. I gave them a nonsense email. The plans this page talks about don’t seem to exist. The plans that are mentioned are still there.